The following was written by zephid7 and can be found in it's entirety here. 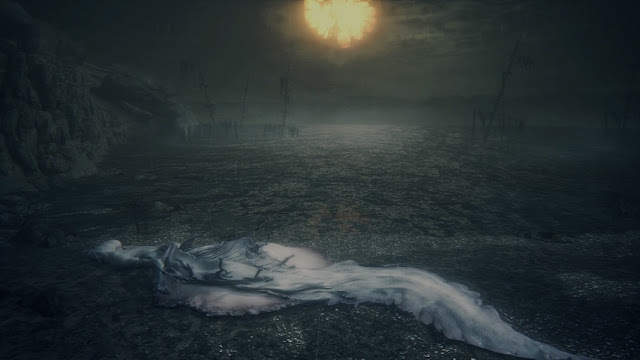 In this 40 page analysis of Bloodborne, zephid7 theorizes that Kos and the Moon Presence are the same Great One in different forms, and explores the ramifications this has on the narrative of Bloodborne. "When we sleep, our bodies repair damage we have done to our muscles, strengthening them for the day to come. Great Ones in their slumber also repair their bodies and change them, but their greatness enables far more drastic change. Their sleep after physical death is therefore like what it appears a caterpillar does after weaving its cocoon, becoming inert or “sleeping” for a considerable period while it metamorphoses into the butterfly that will emerge. This is like the molting of phantasms, the familiars or augurs of the Great Ones, but on a grander scale. It is like cocoon theory’s procedure for getting from a celestial child to Ebrietas, but passing beyond a mere biological threshold. When a Great One awakens from their sleep, they will have taken on another form. In this way, death is not the cessation of life for Great Ones, but the marker for another life-stage. If death is understood as a life-stage for Great Ones, the point at which they begin to metamorphose into new forms, “eyes on the inside” take on new meaning. Instead of simply “elevating one’s thoughts” as Provost Willem had it, they act as the means for self-guided evolution, mirroring the way caterpillars retain imaginal discs (which vaguely resemble eyes before they are activated) that shape their body’s transformation in the cocoon. Unlike lower organisms that transform according to a set plan, “eyes on the inside” would allow a Great One to intelligently shape their metamorphosis into desired forms, and eldritch beings presumably are not limited to biological forms alone. This could add some context to the presence of Oedon’s tomb and his formlessness, as well as more firmly establishing the Great Ones’ reliance on blood echoes over blood. Eldritch beings that dismiss embodied forms at every death would exist more in the metaphysical blood echo than in physical blood."